Hannah Genders takes us through her plans for growing plenty of vegetables this spring. This has to be one of my favourite months – the winter is finally behind us and spring is well on the way, giving me lots of time and longer evenings to be out in my newly refurbished veg garden. This is my third year of growing vegetables in my new garden, and it should be the best yet. My veg garden is at the furthest point from the house; it has an old greenhouse that I have repainted and Mike and his dad have repaired all the glass panels, and I have to say I love it. The view across the open fields at the back is to the Malverns, now that we have cut back the overgrown hedge, and the whole area is sheltered but gets plenty of sun in the day and late into the evening. So it’s perfect for most vegetables which do need a lot of light. We cut down three trees that were growing in this plot – one was quite a nice cherry but nothing would grow underneath it so I needed to be ruthless. The only trees I have left in are trained fruit trees at the front of the veg garden; these were overgrown but have now been pruned back to their original shape and tied into new wires and posts to keep them as a pretty and productive screen. This works really well if you only have a small plot and you can grow some ground cover plants underneath. I have primroses, low growing comfrey and some foxgloves at the back. Last September we put the whole area down to raised beds, just using old planks we had lying around. If you don’t have any, old scaffold boards are just as good and if treated should last a number of years. The paths are gravel, laid over a membrane to stop the weeds coming through and wide enough to get between the beds. The beds are generally 1.2m wide to allow me to reach each side without having to stand on the soil. This is really good practice for any garden situation but especially for clay, as the soil will compact when walked on and plants have a harder time getting established. I only have one large bed which I didn’t want to disturb last September as it still had a good crop of beans to be picked, so I guess we’ll get it done at some point. To prepare the garden for winter, I covered each bed with a good quality mulch. The one I use is from a lovely woodland near me and is actually made from very well-rotted leaves, probably about ten years old, so it’s like black gold. But any well rotted manure or compost would be just as good. I don’t bother digging this in but let the worms take it into the top layer of soil and enrich it for me. On any bare patches I then planted some green manures – the seed for these can be bought from any good nursery or garden centre. You plant them in the autumn and then leave the seeds to come up over the winter, digging them into the ground in early spring. They feed the soil and add lots of nitrogen for new spring growth. Now that April is here I already have plenty of plants in the ground: onions, both red and white, and garlic, which is coming up really well. I planted my broad beans in two hits, a hardier type called Super Aquadulce in November – these are well on and I hope to harvest them before the dreaded black fly hits in June. The second crop, planted in February, is a heritage variety with red flowers, very pretty and succulent pods but a slightly lighter cropper. My runner beans and climbing French beans are all coming along nicely in the greenhouse. I won’t plant these out until late May to avoid all frosts, and the potatoes are in the large bed at the back. I’m growing the yellow courgettes again as I think they have excellent flavour and produce well. Parador is a good variety; I usually plant these under the climbing bean structures. They are quite happy with a little shade and seem to like the more sheltered environment like this. 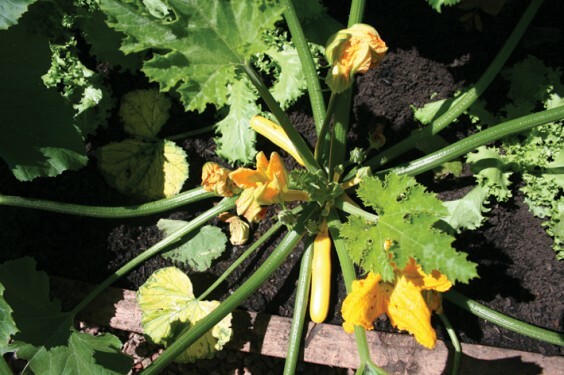 Again, if you have very little space a courgette will grow very well in a pot, but make sure you put it in a sheltered area in your garden away from strong winds. A whole bed will be given over to salad crops as we get through so much of these in the summer – I’ll grow everything from beetroot leaves to rocket and red lettuce. Along with all my planting out, I have been promised some help with the last major job: to get the chestnut paling fence put up around the plot. This will keep out any rabbits as it also has chicken wire along the bottom, making sure what I grow is eaten by us and not the local wildlife. With so much exciting potential for growing crops this year and the enjoyment of being hidden away in this part of the garden, this is where you’ll find me from spring onwards – and hardly ever in the house!